Sometimes my creations have elaborate origins, like “I’ve been working on the idea for 15 years” or it came to me one day in the bathroom. (Bathrooms and cars being places where I have most of my best “idea bursts”) But I’m sorry to say the NES Micro had no such “stroke of inspiration” behind it. Rather I just had an extra NOAC (NES-on-a-chip) Asian joystick game laying around and figured I may as well do something cool with it instead of letting it collect dust. You may recall that last year (2004) I also cobbled together a NOAC portable, so the thing here was to do something special. As many of you know I keep close track of Nintendo’s monthly Gameboy hardware releases so of course I knew of the GBA Micro. 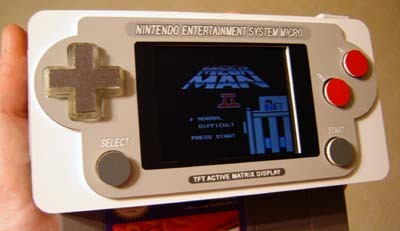 Then it struck me – why not make an NES micro? Ridiculously small screens and cramped controls shouldn’t ONLY be reserved for newer games! My path was set! Most of those cheap overseas NOAC game joystick things (or Super Fun Mecha Joy-Joy Stick Fun units as I call them) have 60 pin Famicom (Japanese) cartridge connectors on them. So as with my last NOAC portable I had to hand-wire an adapter. 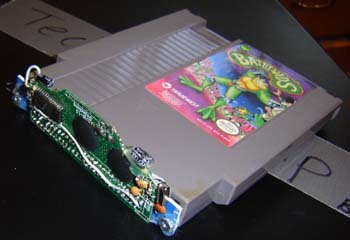 The American NES has a 72-pin card edge connector. 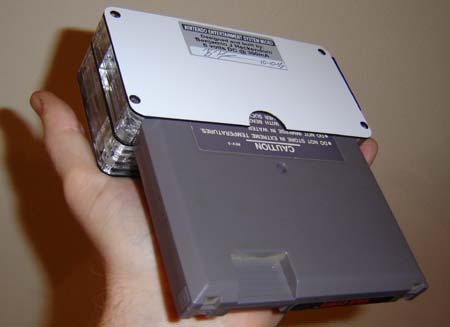 This is a working NES clone, complete with American 72-pin cartridge slot. The NOAC, wired and plugged into a cartridge from an era when Rare didn’t take 5 years to make each game. As close to the X Y width/height as a GBA Micro as possible. A GBA Micro is 4″ x 2″ on the X Y. I didn’t worry about matching the Z/depth as the NES cartridge is thick and makes that impossible. Measure all the parts the portable requires. 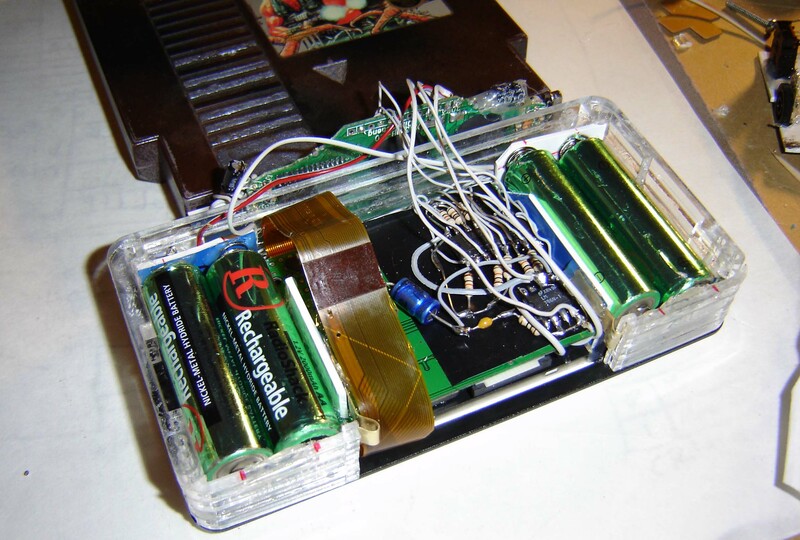 Typically cartridge, system guts, screen size and batteries. Re-draw parts as vector objects on computer. As with many of my more recent portables the parts for this were cut out of Acrylic and engraving plastic using a laser engraver. This allows for much smaller and more accurate parts than can typically be had with a bit-based CNC router. After the parts are cut they are stacked and glued together. 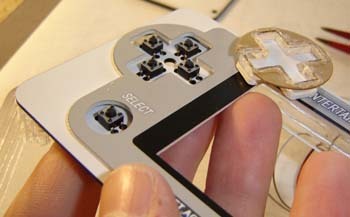 See, most of the unit was made from 1/4″ plastic, so the pieces get stacked to form the actual case. 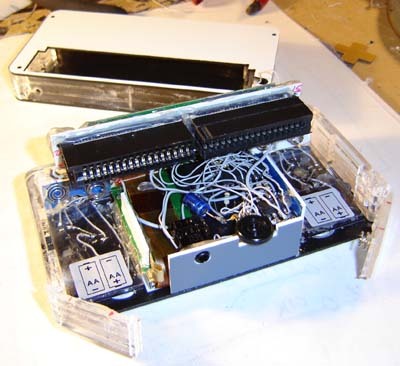 By having different layers I can put various level screw holes, spaces, etc inside the case. Decals are also printed (using a thermal vinyl printer) and attached to the surfaces. This is a very important part of the process as it’s important for the thing to look good! And now comes the second hardest part of the whole process – installing all the guts. See no matter how much planning I do in the design phase there’s always tons of monkeying around to get everything to fit. I started with the controls, which basically consists of tact switches under the buttons. The wiring is simple so instead of having PCB’s made (which would exceed the LCD screen in expense!) I just do it by hand. I ended up using a 2.5″ screen, a little bigger than a GBA Micro. And yes it looks sharp, like the GBA Micro. But that’s only because it’s smaller! Rule of graphics – anything look better smaller. The front half of the case. With screen and controls/control wiring installed. Note the battery doors swung out at the bottom. This next photo shows how the batteries fit inside the case. The main design “idea” was the case would be not much thicker than the screen or batteries, and not much wider than them set side-by-side. This photo is a good example of that. When building something like this the biggest “things” are always 1) system guts 2) screen 3) battery and 4) game cartridge. Everything else, like power supplies and IC’s for audio amplification are all considered secondary (at least in my book) That “extra stuff” can be fit anywhere! 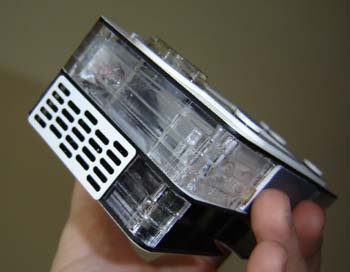 Side/end view showing the vertical layout of the parts. Batteries, screen and front portion. For the battery contacts I used the metal terminals from a pocket TV case (Shocking I have several zillion of those laying around) The big springs on the negative sides were cut down a bit to relieve the pressure on the battery doors. Here you can see the NOAC has been attached. Really all that hooks to it is +6 volts, ground, Audio, Video and 3 wires for the controls. Here’s a close-up detail of the hand-wired parts I put just behind the screen. (This is the “extra stuff” mentioned a bit ago) A NES controller is a bit more complex than say an Atari 2600 joystick so the shift register IC and some pull-up resistors are required. 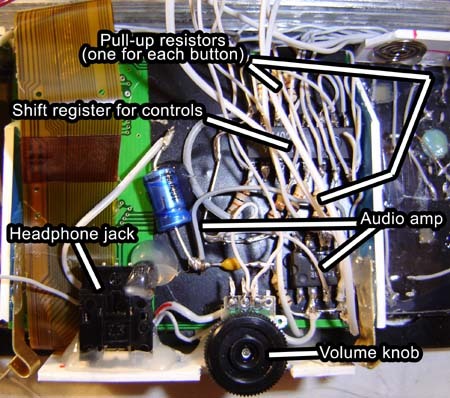 You can also make out the 386 audio amp, its capacitors and the volume knob. Oh and the headphone jack. 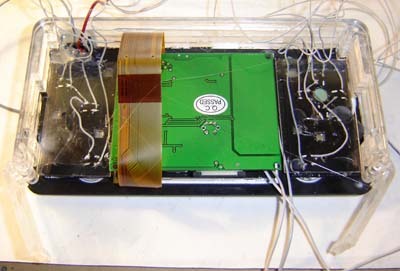 Note the overly long LCD-to-controller board ribbon cable coming off the screen – that thing was a pain! The NOAC guts are then stuffed into the top of the unit as shown below. It sort of holds the battery tabs in place (blue thing on middle left of photo) It’s packed so tight nothing is gonna go anywhere, believe me! The unit with the NOAC board installed, speaker wired and rear half of case ready for final assembly. Finally the rear half of the case is set over the front and screwed in place. I put some nuts on the NOAC board, this allows screws to go through the top of the rear half of the case and attach itself to the NOAC board, as seen below. Since the cartridge will push and pull at that point this is pretty much required for extra strength. Oh and you can also see the power switch. 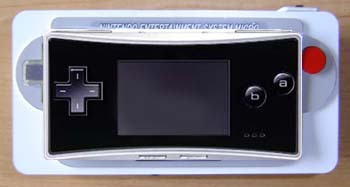 Front view with game running. When the batteries get weak (like 5 volts total) the screen gets a little dimmer but still fine. Because of this normal alkalines, rather than rechargeables, are best. The speaker ended up on the lower left hand side. Space was so tight this was the only place it’d fit. Oh well. Chalk one up for weirdness. View from the rear. Look – screw wells! The first time I’ve ever used them, shocking I know! And now finally, my NES Micro compared to a GBA Micro…. OK so it’s not AS SMALL but considering it takes full size NES cartridges and was built basically by hand I’d say I didn’t do a bad job in shrink-a-fication. Pingback: Post Collection: Vídeo Games Portáteis | Deu Curto!